The Snore Eliminator is a standard mouthpiece at an affordable price. It is basic, yes, but does have something that nothing else has. Before I get into that, let's find out what else is in store with this particular mandibular advancement device. Snoring seems to be the problem for the ages that no one wants to talk about. It can be embarrassing, but if you don't address it, you might be ignoring a much bigger problem. I'm going to help you with that. Up for discussion here is the Snore Eliminator'”after all, what better way to eliminate your snoring problem than to choose a product that tells you it will eliminate your snoring with its very name? Not so fast. There are a few things you need to know first. There are a lot of different snoring remedies out there, and you don't want to risk your health without first checking it out, right? Let's cover some preliminary information first'”a little bit of general information about what the Snore Eliminator is and how it can help. The Snore Eliminator is a mandibular advancement device (MAD) and is designed to hold your jaw in the forward position just a bit, thereby opening up your airways and preventing snoring. MADs are considered Class II medical devices by the US Food and Drug Administration. While not a necessary distinction, something you should look for in any snoring mouthpiece is FDA clearance. This means that the FDA has checked it out for safety'”how it's used, if the instructions are clear, and if its chemical composition is safe. Look for this before you buy – it means they did their homework, and it is considered safe by the US government. The Snore Eliminator does not carry a FDA-cleared certification. Red flag, in my opinion. Who Is Behind The Snore Eliminator? The good news is this device was developed by a medical professional. His name is Dr. William Vachon of Myrtle Beach, South Carolina. He has been a dental practitioner for over 15 years. The company behind this mouthpiece is Sylvan, Inc. They introduced this mouthpiece in 2011. It's been for sale for four years in the United States and is still going strong, which is an excellent sign. The bad news is not the company nor does the developer have a company page to view. The company does have a Contact Us page, but no About Us page. I tried to verify that it is FDA cleared by checking with their database. However, I couldn't find it there. The BBB site shows that the company is not accredited by the Better Business Bureau. This is not a dealbreaker, of course, but it is an interesting fact. In the end, the lack FDA credentials don't necessarily mean it's a bad device. Of course, it doesn’t mean it’s a good one, either. The Snore Eliminator doesn't allow for any real adjustments. However, it is made from thermoplastic, which does allow you to customize it to your mouth'”that's more than I can say for some snoring mouthpieces out there. Here's how that works. Thermoplastic is known by most manufacturers as boil-and-bite technology. Boil some water, and submerge the device. Take it out of the water, and while it's soft and warm, bite down on it'”but not too hard. Bite down just hard enough to create a comfortable mold with your teeth. The idea behind this is to create a custom mold of your exact mouth. This is far cheaper than dental clay, without the added cost of a dentist. The custom shape means no pressure points on your teeth, which helps to lessen the possibility of soreness while using the device. It is critical to note that this is not a “unique” thing. As I noted, most MAD mouthpieces do share this “boil and bite” sizing method. The Snore Eliminator solution is backed by a 30-day guarantee, plus probably the biggest perk not seen in any other MAD. The company claims to offer lifetime replacements. That means the company is putting their money where their mouth is. Furthermore, even without FDA clearance, they do claim their materials are sterile and hypoallergenic. As with any MAD, you should expect some soreness in the morning for the first couple of days. Sleep with a small towel near your head because you will salivate throughout the night as you get used to the device. If the soreness is excessive or if lasts more than a week, discontinue using the Snore Eliminator. This is a jaw retaining mouthpiece. Before buying this or any other mandibular advancement device designed to displace the natural position of your jaw, make sure that obstructive sleep apnea is the root of your snoring issue. Your issue might be much deeper than you realize. Some causes of snoring, like central sleep apnea, require the attention of a medical professional. As a jaw retaining device, there are better ones out there for the price, but none of them carry a lifetime replacement policy. Just because you can't make adjustments doesn't necessarily mean this mouthpiece is unusable. I suggest trying it first. My jaw is different from your jaw, and while I have had experience with better MADs, it doesn't mean that you shouldn't at least try it. This seems like a solid device, even if it doesn't carry some of the most desired credentials. Personally, I would skip this one. I've found better ones at comparable prices with more features, like adjustability. Even with the lifetime replacement policy, you won't want another one if this one doesn't work for you. It's your mouth and jaw. You only have one of each. Take care of them! 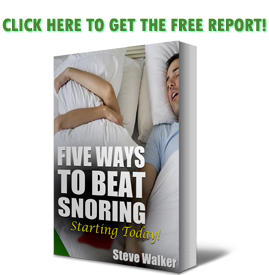 If you still want to try it, find the Snore Eliminator here.